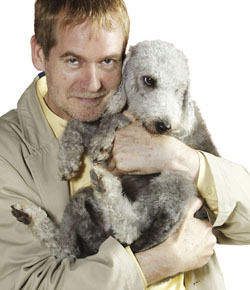 It seems everyone is talking about the BBC1 documentary Pedigree Dogs Exposed. It's on next Tuesday evening at 9pm. No one's actually seen it yet! But certain people are already complaining that it's biased. "Fifty complaints will irritate them, one hundred will worry them and two hundred will bring tears. With the number of you out there you'll be able to swamp them. If the editor will permit it I would like to use the famous words used by Lance Corporal Jones in every episode of Dad's Army, "They don't like it up 'em. Cap'n Mainwaring, they don't like it up 'em." So what is all the fuss about? The KC's statement shows they really do have their masonic dinner jackets in a Pug-esque double helix. Do have a read. Passionate Productions has made a documentary about pedigree dog health and they've talked to the Kennel Club (and lots of other experts all over the world) for more than two years. But either the KC has a very well informed mole at Broadcasting house who has put the wind up them or they just have an overpowering sense of dread that when the spotlight is put on their guardianship of pedigree dogs' health, they're not going to end up looking very good. And this will of course be down to the edit, the bias of the documentary makers, the lighting, that TV adds a stone and of course lots and lots of conspiracy theories that everyone is out to get them for perverse reasons. If they come across as looking half as bad as they seem to fear, it'll obviously not be because they should have got their finger out 20 years ago and actually done something (and apologies while I get the scratchy old broken record out one more time) like bringing in compulsory health tests, measures to stop inbreeding, changes to the judging system to really stop exaggerations being rewarded...(stop me when you're asleep)....I will go on and on. And yes, we all know all about the Accredited (Discredited?) Breeders Scheme, the subtle changes to the wording of some of the breed standards and the Challenge Certificates. But we also know that actually getting any reasonable level of take-up on testing just isn't going to happen without an element of compulsion. The good will always be good even when no one's looking, but the mediocre will be the majority and simply won't bother or even realise they should be testing without some coaxing. And, until you reprimand judges for giving awards to exaggerated dogs, no one will start breeding dogs that look any different than before. And please, if you feel the programme is balanced do let the BBC know as they've already heard from lots of psychic people who know it isn't going to be! And again harking back to Dad's Army for a further moment I'd say to the KC, "Don't Panic! Don't Panic!" Just sit down without prejudice, watch, listen and please, please, please don't just get the hump - take any criticism on the chin - and start doing something more effective even if does ruffle a few feathers in the show world! Who knows, they might have been totally impressed by your efforts - if you really do believe you've done your very best what have you got to fear? I'd personally like to see the KC lead the poor battered pedigree dog out of the health minefield before it's too late for some of the worst affected breeds. Hopefully in 20 years time if someone does a documentary on pet health the KC of that day won't be caught with their pants down. Get that broken record out again someone... if only they'd started doing the things the Swedish Kennel Club did 20 years ago instead of resting on their laurels and telling themselves that they are THE Kennel Club and that our sensible Nordic neighbours couldn't teach them anything! I can't see the Swedish Chairman making all this fuss about being asked a few awkward questions! But perhaps they never showed Dad's Army over in Sweden? PS Should anyone want to learn more about health problems and testing we have produced a chunky little booklet called "The Little Black Dog Book". It explains all the major probs in an easy to digest format, gives case histories of people who have dogs with these conditions and lists what tests you should insist on if you are acquiring a pup on a breed by breed basis. This booklet costs £2.50 inc UK postage and if you click here you'll be able to buy it on line. If you click that link you will be taken to our Furry Godmother website which offers lots of free information and contacts for anyone researching looking for a dog - but the booklet is much more in-depth on health and is a useful reference point. Our very detailed Fido Fact reports on each breed also include a full page from geneticist Dr Malcolm Willis giving each breed a very detailed health MOT that often goes much further listing conditions that you can't yet test for. Fido Facts for most breeds can be bought on line, too. Those not available electronically can be ordered by phone. Well said. Why can't the show dog world, for that is the world I feel we are talking about here come to this film with an open mind? What have they got to fear? Why wouldn't this film NOT be an ally in our battle against canine disease and it's blight on our wonderful breeds? I would like to ask Mr Ronnie Irving why on earth is he so scared of their voices being heard. Well my voice being heard as for four years I was one of those pet owners and the experience was heartbreaking. Why Mr Irving are you so scared of hearing our story? I've been really looing forward to this programme and my one concern was that the KC would be too shielded from any blame. I really do hope that they are portrayed in their true light as having done too little, too late. I'm always concerned that the KC seem to want to be an authority without responsibility. The judging criteria on "exaggerations" is one example as is the lack of any responsiblity towards the health of dogs (both via the inbreeding/narrow gene pool used and the continued promotion of breeds with known problems). I have dogs who are both pedigree (although the papers went in the bin the day we got them) and non-pedigree breeds. I'm a little fed up with the "professionals" telling me that my "mongrels" (I knew the parents so they can't be) will never be accepted by the KC as breeds. (labradoodle and golden doodle). My response is that I really hope they never are, as it will leave the breeds I love open to the nonsense that the KC has become and condemned to poor health for the "purity" the KC wants and the judges demand! Thanks for the info Beverley. I was so disappointed with the BBC over this. What a dreadful piece of over sensational journalism!!! The problem really is with the breeders that are knowingly breeding dogs with conditions. How can the Kennel Club know what is going on breeding wise on some farm in the sticks?? They are not the secret police or Big Brother and quite rightly the head vet of the BVA said that it will be disaster if the Kennel Club became obsolete and no-one will monitor the situation. The BBC, quite rightly, have picked on an issue that is a concern, but I think have blown it with getting dog lovers and responsible breeders on their side by the way they have portrayed their case. In particular, I really didn't like the way they subversively confronted the winner the Cavalier King Charles spaniel after she had won her show. Yes the woman shouldnt be breeding with a known condition, but I actually felt sorry for her as the journalist was completely tactless and cringeworthy in her approach. And quite rightly they told the journalist outside Parliament her approach was disgusting - it was. I was in tears at the state of some of those dogs, and thought it was really sad, but they didn't talk to any breeders who have bred AWAY from conditions to remove potentially fatal illnesses. To me, if they had done that, and talked to prominent breeders about what other breeds have done to solve problems, would have convinced me this was balanced journalism. It was not. Good luck to the lady Carol Fowler who is waging a battle of awareness. You were the one positive thing in this documentary.